It certainly won’t feel like the holidays until you’ve experienced “A Charlie Brown Christmas”! It’s Christmas time in the city… and at Carnegie Hall! 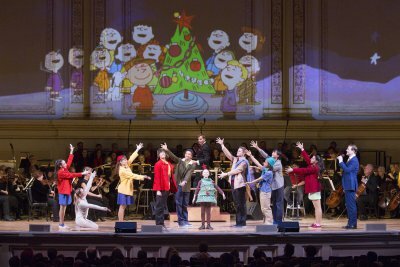 The New York Pops with music director Steven Reineke and Carnegie Hall’s Weill Music Institute treated New Yorkers and their loved ones to a heartwarming concert of Vince Guaraldi’s A Charlie Brown Christmas with everyone’s favorite friends – the Peanuts gang! The iconic Carnegie Hall was aglow with anticipation and holiday cheer, as fans young and old gathered together to celebrate the joy of the season. Choreography by director/choreographer Liza Gennaro, as performed by dancers from New York Theatre Ballet is sleek and stunning. Dancers succeed at capturing that wholesome and youthful energy reflective of the magic of the season. Legendary actor, John Bolton, served as narrator and was flawless in his delivery as he set the scene for the classic tale. Additionally, Bolton treated the audience to the sound of his lovely voice as he performed favorites such as “Hark! The Herald Angels Sing” and “Joy to the World.” His exuberance, sophistication and charm provided an extra sparkle that kept audiences not only engaged, but in awe. Dancer Joshua Andino-Nieto took on the role of Charlie Brown and was joined by Amanda Treibner who starred as Lucy and Michael Wells as Linus. The trio brought the wholesome characters to life as they recreated Charlie Brown’s journey to finding the meaning of Christmas, including the famous scene picking out his sad tree, played by the adorable Finley McElhinney – and made the audience fall in love with these friends all over again! Members of the classic Peanuts gang were voiced by students from TADA! Youth Theater: Samantha Pohly as Lucy, AJ Walker as Charlie Brown, and Michael Sanchez as Linus. The costume design by Carmina de Dios stayed true to the simple designs that each character is known for – down to the trusty blue blanket that Linus carries with him everywhere. A truly special and delightful gift, A Charlie Brown Christmas brings joy and peace to the heart of even the most jaded New Yorker. It certainly won’t feel like the holidays until you’ve experienced A Charlie Brown Christmas! Adrienne Warren, Jessie Mueller, Will Chase and Christopher Jackson joined the orchestra for a rousing program of songs by notable singer-songwriters. A triumphant celebration of the legendary song writing team with the orchestra’s superb musicianship as well as guest artists Tony Yazbeck and Caissie Levy. Guest artist Megan Hilty joined the celebrated orchestra for a spirited program of holiday songs that included a Hanukah sequence. Santa also appeared.